Mee Siam, which means "Siamese noodle", is a dish of thin rice noodles (vermicelli) in spicy, sweet and sour light gravy. It is one of the popular one-dish meals in Singapore. 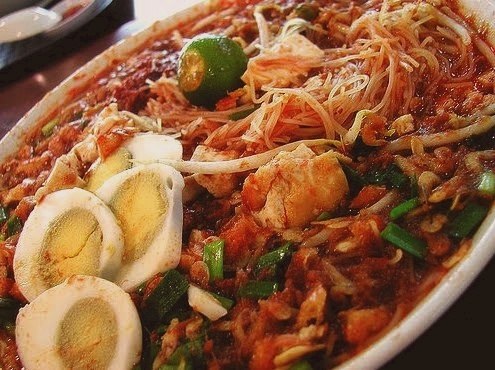 A "dry" version, which is essentially stir-frying the rice noodles with the same spices used in the "gravy" version, are also popular among the Malays and Chinese in Singapore. Originally a Thai dish, it became a Nyonya specialty that is now prepared by Indians, Malays as well as Chinese stalls in Singapore with slight variation in ingredients. It is served with salted soy beans, dried bean curd, boiled egg, and tamarind, garnished with spring onions and Chinese chives. Mix tamarind with water. Strain off pulp and reserve the juice. Cook shallots, garlic, dried chilli paste and onions until fragrant. Add remaining ingredients and bring to boil. Reduce heat and simmer for 45 mins. Check seasoning. Soak vermicelli in cold water to soften. Drain dry, blanch in boiling water for 30 secs and strain. Heat oil in wok and cook shallots, chilli paste and dried shrimp until fragrant. Add vermicelli and bean sprouts and mix well. Remove from heat. Place spiced rice vermicelli in bowl. Add piping hot gravy. Garnish with egg wedges, chopped chive, prawns, soya bean cake, fish cake and lime. Sambal sauce may be added. Combined grated coconut with warm water (A). Squeeze out coconut milk and set aside. Combine dried tamarind paste with warm water (B) to obtain juice. Gravy : Place coconut milk, soy bean paste, onion and 3/4 of the ground dried chillies, shallots, shrimp paste and dried prawns in pot. Simmer for 30 minutes. Add tamarind juice and sugar to obtain a sweet and sour taste. Set aside. Heat 6 tablespoons oil in wok till hot. Stir-fry remaining ground ingredients till fragrant. Add rice vermicelli, bean sprouts and enough water to cook rice vermicelli. Place some rice vermicelli in serving dish and pour in gravy. Garnish with sliced eggs, bean curd puffs and chives. Drizzle with a little lime juice. great mee siam recipe! will definitely try these soon! keep em coming! good job! :). Wow Very good recipe…I like it, I try this once.